Stacia Leigh at Espial Design: Junk or Treasure? ...an old gem from my childhood, Famous Fairy Tales. It has been duct taped, inside and out, and yet is still missing the first forty-two pages with these classics: Cinderella, Hansel and Gretel, and Jack the Giant Killer. Why keep this thing? Why not give it a new life by recycling it into cards to share with my friends? So I drug it down to my basement studio and flipped through the chapters...perfect! But I can't seem to make myself tear the pages out! This book has been kicking around since I was a little kid. It's been read and loved in Montana, stored in a box in Alabama, moved back across the country to Oregon, and now is seeing the light of day in Washington. Where else can you find a book with crusty, forty-five year-old duct tape, hot chocolate stains, and an advertisement for a free can of Folger's Coffee? 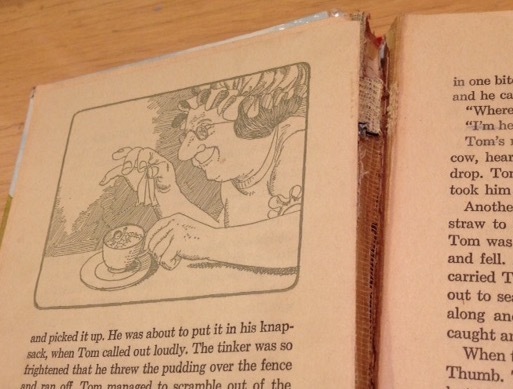 When I flip through the pages, the book automatically falls open to Tom Thumb on my favorite page, sixty-four. I love that picture of Tom taking a bath in a tea cup. So tiny, so cute! Guess I'll keep it a while longer.